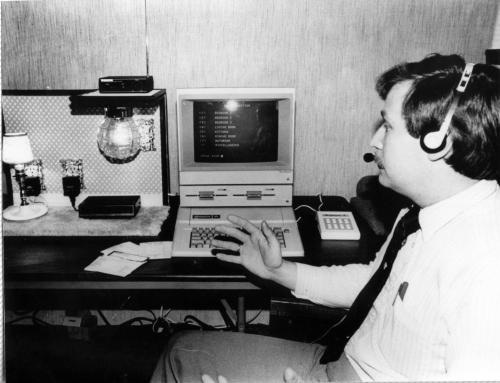 The SoftVoice Computer System could now actually have a two-way conversation with you. It would ask you questions, you could answer it, and it would obey. This was getting even better, but I still never pursued working with additional disabled. I just wanted to see what I could squeeze out of an Apple. Today, talk and listening computers don’t seem so amazing with Star Trek over 40 years old, and Smart Homes, and GPS, but in 1987 this was some pretty cool stuff. Remember what was the stat of the art in computers? The Macintosh was just over three years old. The IBM competition had only just moved from the IBM Peanut to the Jr. The Osborn Computer had just failed. That Apple IIe was still the biggest selling computer. 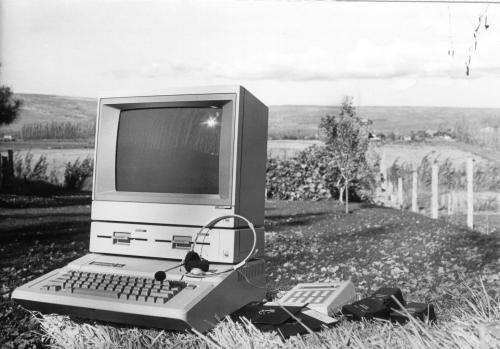 The Apple IIc had just been released, which sold as the first “transportable computer”, the predecessor to the first laptop. The most popular gaming computer was the Commodore 64, and the Amiga. Even the Mac+ was still a 16 bit possessor and only just gone from 500k internal memory to a whole megabyte. The best internal drive was the 400k, 3.5 floppy and a there was a whopping 1 meg external hard drive. Talking and listening computers were pretty cool then. I continually asked myself, could this actually be a company, a smart business venture? I didn’t know. As this was my second company and second set of inventions, I was now officially an Entrepreneur. Unfortunately, the hardships of being an entrepreneur were new to me. Although the emotional rewards were incalculable, it was difficult to continue when so little financial rewards were available. At the time I had made friends with two other entrepreneurs in the Tri-City area, Brian Wallace and Zane Sealy who invented GrabOn foam grips for everything from tennis racquets to bicycles. We shared an inside joke about the significance of the entrepreneur. It was a two-frame cartoon of the B.C. comic strip that shows the young ant talking to his father who passes down his unlimited wisdom. The young ant asks, “What’s an entrepreneur, Dad?” And the father replies, “Beats me. 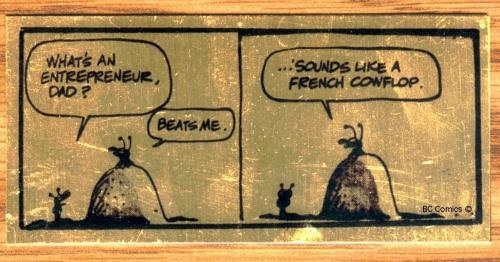 …Sounds like a French cow flop. “It was this type of encouragement that keeps our calling in perspective. That comic strip was cast in brass, mounted on a walnut plaque, and presented to me by Brian Wallace and hangs on my office wall to this day. Birds of a feather do seem to flock together. The entrepreneur community is tight-knit. We seek each other out of support, solutions, and I think mostly, validation. Zane Seely was one of the first entrepreneur’s I met for all of the reasons above. Of all of the Innovators I have met and worked with Zane was by far the most flamboyant. I don’t mean flamboyant in an effeminate way, I mean “If You Got – Flaunt It! When I first met Zane had recently sold his GrabOn Foam company for a very large undisclosed amount and he was enjoying his success. He also had some success with Amera Cosmetics and Nancy Johnson, line of nail care product. Zane was in the process of starting his own competing company efe’ Cosmetics. I just shook my head when Zane drove up my driveway in his Van-‘T’ custom made truck; park van, part pick up, all outrageous. His hair was spiked and bleached at the ends, and he wore a Rolex watch with no hands on it, just a huge diamond in the center of the face. One afternoon while discussing the slings and arrows of being entrepreneur’s, I stared at his watch for sometime trying to figure out how he read the time. There were no hands, gnomon (the sticky up part of a sundial), there were no LED readouts. I checked even on the side of the watch trying not to be too obvious. Finally out of shear frustration, I had to ask “How the heck do you tell time with that watch? !” Zane Selly’s answer ‘It’s Seely Time. After you’ve made your first million dollars, it’s any time you want it to be.” You gotta love attitude! By now it was the summer, June of 1987. I continued to manage the then failing Apple dealership and had decided to scrap the entire SoftVoice project. I put everything in storage boxes and put them in my garage. Even though I had decided to scrap the project, it still bothered me that I could be helping the disable and probably should be helping the disabled, but I didn’t want to. It was too hard. I thought it was great that I could save a life, but I wasn’t making any money at it. Pretty selfish, hugh? That’s exactly what my wife to be said when I told her I was scraping the project. We were at the areas best restaurant and I told her of my decision not to work on the project anymore. She stood up and said “How could you be so selfish?! How could you NOT save people’s lives when you can.” Then she walked away from the table. She did return though to add some “And furthermores”. I was alone in my car, overwhelmed and angry and having one of those conversations with God. You know the one. It’s where you tell God that if he wants you to do something He should make it easier for you. You know, give me a break. Why me? It’s too hard. I don’t want to. Show me a sign and I’ll do it. While all along you know you should be doing it anyway. Ever have one of these conversations? At the end of my conversation, I yelled, “If you want me to continue to work on SoftVoice, then give me a sign and I will!! !” There was nothing. Total silence. No signs. No burning bushes. No clouds parting. So I took a deep breathe out of frustration and slammed the radio volume all the way on. 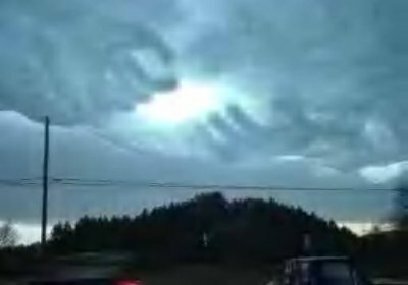 So help me, I yelled at God and He yelled back! It scared the hell out of me. I got my sign. I decided to see how the local Apple office felt about supporting me in this project. I contacted my local Apple rep and set up a meeting with the Apple Washington Office in Everett, Washington. Guess who my state rep was… Guy Kawasaki! The Guy Kawasaki of the Garage.com and “The Art Of The Start” fame. When I knew Guy he was a regional Apple rep and off the charts smart and personable guy. I always enjoyed our conversations. Guy heard about the project and full heartedly supported it. With my Apple Certified Developer status and Guy’s help purchasing Apples directly from Apple out of the Everett office. I now had a source for my computer equipment. In 1987 the only place you could buy an Apple was from an Apple Store. Shortly thereafter, Guy while in Cupertino saw a demo of a database code-named The Silver Surfer, which I believe, hit the market as The Forth Dimension. Apple had purchased the rights to this software and was going to transfer it into their newly formed Clairis software division. Apple’s Appleworks, whch had a great database module built in and was such a great seller, that Apple decided to not pursue the Silver Surfer software. When Guy heard that a product as good as Silver Surfer, was going to die without ever giving it a try in the marketplace, he offered to buy the rights from Apple. Apple agreed and he quit Apple to form his own company to market the Forth Dimension. Guy recognized the potential of the new Macintosh computer and strongly suggested that I transfer platforms from the IIe to the Mac. That would be like starting over from scratch, but I agree that Mac held more potential so I took his advice. And, I really wasn’t happy with the reliability of voice recognition. It never was 100%. It wasn’t as good as I would have liked. In spite of all of these signs, I still needed to earn a living in the meantime. I got a telephone call one day asking me if I would be interested in meeting the caller to speak with him about working on the Hanford Nuclear Reservation in Richland Washington (just across the Columbia River). The caller had seen me television demonstrating SoftVoice and thought that I was exactly the kind of person who could solve a huge problem the government was having with its nuclear waste. I met with him and he said if I was willing to work for the Department of Energy on his project, he would pay me handsomely, I’d get government benefits, and he would fast track my “Q” or Level One Security Clearance. Oooo, this sounded good. I chose to go to work for the United States Department of Energy, Basalt Waste Isolation Project, (BWIP), under the Westinghouse Electric Company, in the Quality Assurance Trend Analysis Division, as a Senior Design Engineer. I carried a two-page business card just for the title. Government loves titles. I was hired to design an artificial intelligence computer system, that would have IBM input capabilities, while supplying the very best desk top publishing output capabilities, and the ability to read and analyze any form of text input and determine based on over 500 reports annually, how the 10,200 employee nuclear reservation’s management performance has been improving, and what pre-cursors were there if any to avoid potential problems based on past experience. How about that? A team of nearly a dozen people from Westinghouse Electric and Boeing Computer Services for more than a year and still had not developed a working prototype. Nine months later, I had the system up, running, and generating its first reports. 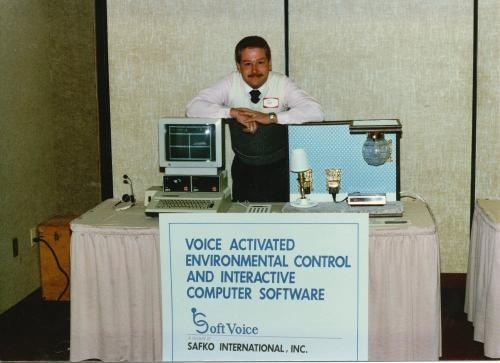 SoftVoice, along with my new wife Sherrie and Phil Collins were still nagging at me every day to resurrect the SoftVoice System.